Samuel Fuller's reputation in recent years has been on the uptick, and with good reason—like their director, his films are gruff and passionate, skillfully made in a guerrilla style that anticipates the independent film movement, occasionally round-the-bend crazy, and never suffering fools or highfalutin aesthetes and theoreticians. There's kind of a hypnotizing coarseness to Fuller's pictures—I'm partial to the lunacy of The Naked Kiss and Shock Corridor, myself, though there's plenty to be said for his genre pieces like Pickup on South Street. In his later years, Fuller wanted to make his war epic—a veteran of World War II, he wrote and directed The Big Red One, but it was hacked up pretty severely by some misguided studio editors before its theatrical release in 1980. What we got to see back then was a film that was passionate, brutal about the war, and made with Fuller's typically fierce energy—but it was also kind of a mess, with truncated scenes and sequences, and characters evolving in ways that seemed arbitrary or opaque. You sensed that there was something more there, but you didn't know just what that was, nor if a proper version of the film would ever see the light of day. What's especially startling about the picture is that it's got the nihilism about the pointlessness of war that we associate more frequently with films about Vietnam, not about WWII. (This was made a year after Apocalypse Now, and two years after The Deer Hunter.) The title refers to the First Infantry Division; to mark their affiliation, the soldiers in the division had taken to sewing a patch with a big red "1" on their sleeves. As with so many war movies, this one focuses on a single platoon, whose nameless leader is known only as The Sergeant. Lee Marvin is mesmerizing in the role; he's the best-known actor in the cast, but this isn't a star turn. Rather, his Sarge is all the things you'd want in a soldier: brave, compassionate, committed to victory and to the well being of those under his command, and, perhaps most important, keenly aware of the inherent madness of the venture in which they are participating. A quartet of soldiers survive along with Sarge, though the others who fill up the ranks of their platoon don't always meet with the same happy fate. Mark Hamill is Griff, a sharpshooter made queasy by the prospect of killing anybody; the question of his valor and bravery is a consistent one for the members of his squad. Bobby Di Cicco is Vinci, impossibly confident; Kelly Ward is Johnson, always a little uneasy. And Robert Carradine is Zab, the obvious Fuller surrogate—he's almost always got a big old stogie stuffed in his craw, like his director, and he's in pursuit of literary glory, looking to survive to write a great war novel, presumably along the lines of The Naked and the Dead. There isn't one central thrust to the narrative, other than the overarching notion that war is in fact hell. We meet the squad in November 1942, in North Africa, and stay with them, to Sicily, Omaha Beach, and to V-E Day. There are some extraordinary images in the film—at one point, Sarge escapes from a German hospital dressed as a Bedouin, and rejoins his men as sort of a crazed parody of Lawrence of Arabia, for instance; at another, the squad liberates a group of Sicilian mothers from the Germans, who exact their revenge on the corpses of Hitler's soldiers. But perhaps the high point of the film is Fuller's version of the D-Day invasion. His budget probably wouldn't even have covered the craft services bill for Saving Private Ryan, but the sequence is no less powerful than Spielberg's, the sickening sense of American soldiers being sent like so many lambs to the slaughter. It's a model of what a passionate and talented filmmaker with a keenly articulated point of view can do on even a shoestring budget. There's no great final epiphany or battle sequence, and there are occasionally things that are a bit overdone—a pregnant woman materializes on the battlefield, for instance, and gives birth in a tank; and there's the establishment of a sort of German doppelgänger for Sarge, but the parallelism doesn't really pay off. But no movie is perfect, and no Sam Fuller movie would want to be. It's a great, fierce, ambitious movie about war and its destructive power, both physical and psychological, and this reconstruction helps earn the film its rightful place on the short list of the greatest war pictures ever made. Image Transfer Review: It's relatively easy to spot the footage that's been buried for decades, but the transfer to DVD is a sharp and clear one. Deeply saturated and with strong and consistent colors. Extras Review: There's a wealth of information on this two-disc set, almost all of it worth checking out. I'm not the only one to have complained about Richard Schickel's commentary tracks in the past; frequently his observations consist of little more than narrating what we're looking at, and unfortunately he does no small amount of that here. But he also oversaw the restoration, and when he's talking about that, he's awfully good—he's obviously personally invested in it, and that passion comes through. He has less and less to say as the film goes on, though—it is close to three hours, to be fair—and there's a good late discussion of Fuller's ascending reputation in recent years. So it's worth listening to in fits and starts, to hear about how the restoration happened; unfortunately there's no way simply to leapfrog over Schickel's helpful insights such as the fact that Mark Hamill appeared in the Star Wars movies. Who knew? 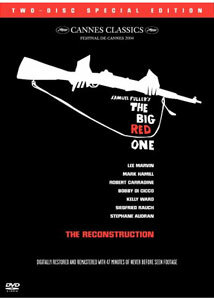 The rest of the ample extras are on Disc 2, starting with The Real Glory: Reconstructing The Big Red One (47m:21s), which features new interviews with members of the cast, all of whom like to show off their Fuller impressions, along with archival interview footage of the director himself. The first half of the documentary is about the production, and emphasizes Fuller's extraordinary charisma; the second is about the reconstruction effort, with Schickel, editor Bryan McKenzie, and the team of craftsmen who put all this old footage through its paces. Next is another installment (54m:59s) from Schickel's series The Men Who Made the Movies, this one of course focusing on Fuller; it's narrated by Sydney Pollack, and provides an excellent overview of the director's career. Anatomy of a Scene (18m:20s) is kind of a misnomer, really, as it offers bits and pieces of several different scenes—there's footage of Fuller talking with his actors between takes, and audio from members of the reconstruction team, especially interesting on a before-and-after demonstration. A package (31m:38s) of 18 alternate scenes features audio commentary from McKenzie and post-production supervisor Brian Hamblin; they address the question as to why there would be deleted scenes from this restored version. (Principally, what you'll find here are different paths to the same place, scenes discarded in favor of others in the final cut that cover the same ground.) The Fighting First (12m:16s) is a 1946 short produced by the War Department, providing some additional rah rah historical info on the Big Red One; perhaps most interesting of all is a promo reel (29m:54s) featuring voiceover work from Lee Marvin. Made before the film's original theatrical release to drum up interest, it features scenes that didn't last through to the studio's cut; it was the first thing that Schickel and his colleagues saw, and ignited the idea of embarking on this reconstruction project. And was Lee Marvin a badass, or what? A stills gallery features 18 images from the set; there are two trailers from the original theatrical release, and another for the reconstruction; and two radio spots used back in 1980, one of them featuring a prominent endorsement from Rona Barrett—really now, who knows more about war than she does? Sam Fuller could almost be a rough-and-tumble patron saint for independent filmmaking; the ferocity of his movies speaks at least as loudly today as they did when they were made. The Big Red One had long been regarded as his Magnificent Ambersons, the one that got away; but thanks to Richard Schickel and a dedicated reconstruction team, we can now savor the film in a version that's probably reasonably close to what the director intended. It's as good as any combat movie you'll ever see, and this two-disc set only adds to its illustrious pedigree. Highly recommended.